Lotréc AB has the capacity to supply the worlds leading industries with large volumes of LUBKO Release Agents and Mandrel Lubricants, yet is small enough to assist those smaller industries with lower volume requirements. Lotrec AB, based just outside Stockholm and is an ISO certified company that has nearly 40 years experience in release agent technology. The high performance LUBKO release agents are formulated and manufactured by Lotrec; Newgate Simms are the UK distributor of the LUBKO product range. Lotrec has an unparalleled level of experience in the field of fluorinated and related materials (such as PTFE), combined with sophisticated binding systems. The Lotrec aim is to offer durable, environmentally friendly products which are easy to work with and compatible with customer needs. 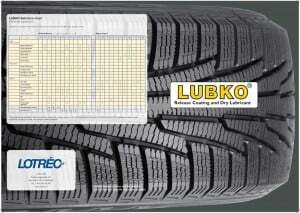 LUBKO products are known worldwide in the rubber industry and used widely wherever sticking and release problems occur. It is often possible to choose between solvent and water based formulation depending on the application you are faced with. The solvent based products are formulated for application on cold surfaces. They dry quickly and form a micro thin, durable dry film. Sophisticated binding systems make the products very durable and also easy to use – heating or baking is unnecessary. We offer a wide range of high tech water based release and anti-tack agents for a variety of uses. It is possible to choose between fluorocarbon dispersions, emulsions or surfactive copolymer types, all silicone free for your particular needs. We also offer a wide range of high tech water based release and anti-tack agents for a variety of uses. It is possible to choose between fluorocarbon dispersions, emulsions or surfactive copolymer types, all silicone free for your particular needs. Some solvent based and many water based products are suitable for applying directly onto hot surfaces and will instantly polymerise for immediate use. In some cases, combined with minor changes in your application technique, you can achieve the same results as solvent based materials whilst using an environmentally safe product. Take a look at the Lubko Product List (8mb) and/or contact us using the form below for a discussion and quotation.